Gary Palmer, Distilled Landscapes. Photo: Courtesy Tarryn Teresa Gallery. SANTA MONICA.- Tarryn Teresa Gallery is pleased to present a solo exhibition of new work by Los Angeles-based artist Gary Palmer. In this site-specific installation of his paintings, Palmer presents his work as a continuous line of interconnected canvases that wrap around the gallery walls. Palmer's unique response to the gallery space highlights both his process as a painter and how this translates into the flowing, gestural nature of his work. 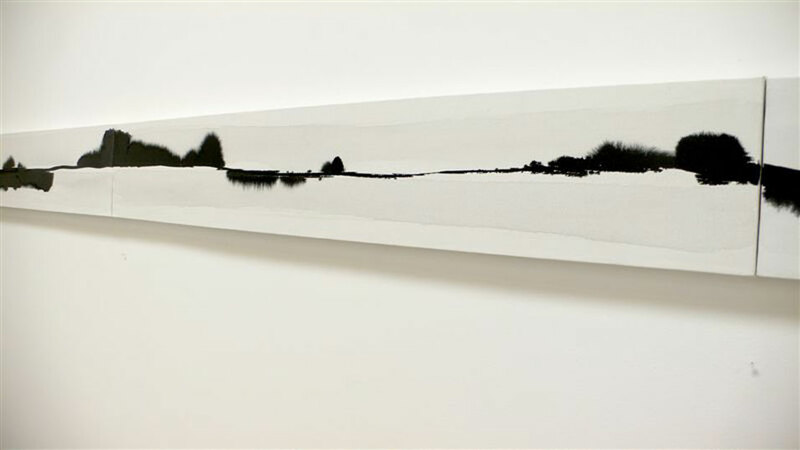 The individual paintings are connected to create one unbroken landscape which is interpreted as a single, continuous black line of sumi ink. Taking his inspiration from Eastern traditions in both painting and philosophy, Palmer deconstructs traditional approaches to painting and distills them to their simplest form. This distillation is not simply a reductionist technique, but a genuine search for the fundamental essence of his subject. Palmer explores this approach to painting in all his work  which also considers the portrait and other figurative subjects - but it is particularly evident in his landscapes. Using sumi ink in a process about which he is openly guarded, he creates fluid lines which are abstract in nature, but inescapable in their reference to landscape painting. The philosophy behind the work is of utmost importance to Palmer. Living for an extended period of time at a non-denominational meditation retreat, Palmer was driven to see painting as a form of meditative practice. With this in mind, he began to explore the painting process itself as a distillation or deconstruction of thought. This is also linked to his studies in architecture, which have always been a source of inspiration for the artist. Palmer states, My current work seems to return to architecture in that it comes from a deconstructivist idea about dismantling the structure of paintings. It is a dismantling of traditional pictorial painting and an attempt at ultimate purity, simplicity, and minimalism. Palmer is the founder of The Distillery LA, an art collective based in Venice where the artists involved use experimental approaches to create new interpretations of existing traditions. This requires engaging with the work on a conscious level, which is intrinsic to the way Palmer works as a conceptual artist. In Landscape Series #1, we see the work in its most simple incarnation. The horizon is reduced to a single black line, and this particular line is thinner than most. What first appears as an abstract line of sumi ink slowly reveals itself to be a landscape. The line experiments with depth of field, creating areas which seem close, while others appear more distant. The horizon bleeds into abstracted trees, bushes, bodies of water and sky. The ink forms a fractal-like cracking as it pools and dries like the branches of a tree spreading across the canvas. The natural occurrence of the paint on canvas also has to be taken into consideration. There is an element of accident, playfulness and surrender to the nature of the materials. Through the process of painting them, Palmer allows the ink to behave naturally and respond to its own particular ebbs and flows. He asserts, The resultant works are as much a diagram of the way nature behaves as they are a pictorial representation of it. These paintings are a modern interpretation of an ancient form, speaking to our memories and subconscious connections to the universal "landscape". Palmer likes to point out that the images are totally arbitrary, yet for the viewer they evoke very personal experiences of nature. Although they are open to interpretation, they are unequivocal in their ability to resonate on a deeper human level. Their ability to connect with our own memories of nature is, in the end, their ultimate power. Palmer was born in Belfast, Northern Ireland. He received his Masters in Architecture from the University of Edinburgh in 1992. He has led a rich and varied artistic career, including spending several years as a street painter from which he experienced international recognition. In 1996, Palmer published a book of his street paintings titled A Carpet of Dream, recording his work and travels in Europe and the US. He also has a series of work titled The Road to Zanzibar, which chronicles his travels in East Africa. Palmer plans to write a book about these travels including the paintings from this series. He is also the founder of Mythmaker, a non-profit organization that teaches children about other cultures through storytelling and chalk drawing. His work is held in numerous private collections and also at the Ulster Museum in Belfast. Tarryn Teresa Gallery will be showing Palmers Color Fields series in 2009. Tarryn Teresa Gallery is a contemporary gallery committed to showing conceptually driven work. We represent both local and international contemporary artists working in all mediums. Our focus is on artists whose statement is in conscious alignment with their process - most importantly, those that challenge and intrigue the viewer on both conceptual and visual levels. Bergamot Station is the largest art gallery complex and cultural center in Southern California. Tarryn Teresa Gallery is located on the south end of the complex, near the Santa Monica Museum of Art. The gallery is open 11am to 5pm Tuesday through Friday, 11am to 4pm on Saturday, and by appointment. Admission and parking are free.